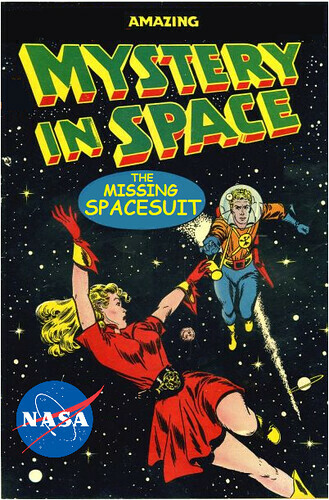 NASA’s much-publicized all-female spacewalk has been cancelled due to a wardrobe malfunction. The U.S. space agency has only one spacesuit in size “Medium.” Houston, we have a gender-specific problem. Image by Mike Licht. Download copies here. Creative Commons license; credit Mike Licht, NotionsCapital.com. NASA Administrator and former rocket racer Jim Bridenstine, the first non-scientist to head the U.S. space agency, has introduced the first U.S. astronauts since Evel Knievel the Space Shuttle crews retired. These space voyagers won’t be traveling aboard NASA rockets, but will ascend through the firmament atop commercial missiles provided by SpaceX and Boeing. 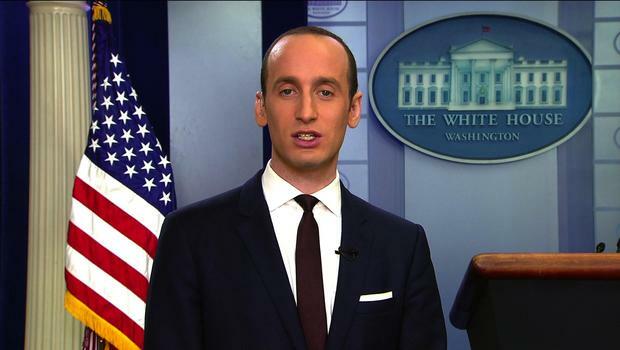 Another way to think about this: The Trump Administration is providing potential human sacrifices to corporate America and paying them for it. When Administrator Bridenstine was a Republican Congressman from Oklahoma, he led GOP efforts to commercialize space and prioritize human space stunts missions over scientific discovery. As Executive Director of the Tulsa Air and Space Museum, Mr. Bridenstine put the museum in the hole by using its resources to fund a Rocket Racing League exhibition. One of the owners of the Rocket Racing League was Jim Bridenstine. Commercializing space, indeed. God help our new astronauts. The U.S. Senate voted 50-49 to confirm Republican Congressman Jim Bridenstine (OK-1) as NASA Administrator. Mr. Bridestine, unlike the first 12 space agency leaders, is not a scientist or aerospace engineer, though he flew an E-2C Hawkeye turboprop in Latin America as part of the War on Drugs. Mr. Bridenstine’s more recent aerospace experience was as Executive Director of the Tulsa Air and Space Museum, where he managed to put the museum in the hole by using its resources to fund a Rocket Racing League exhibition at the Tulsa Air Show in 2010. 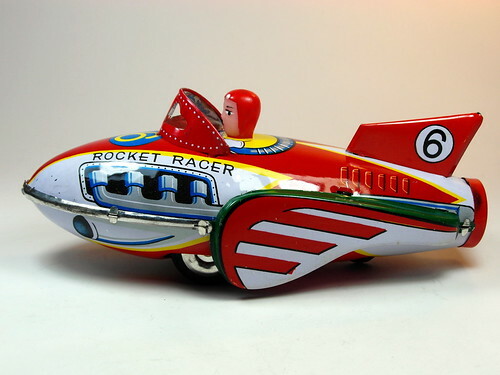 One of the owners of the Rocket Racing League was Jim Bridenstine, a classic case of self-dealing. Annual budget of the Tulsa Air and Space Museum: $1 million. Annual budget of NASA: $18.5 billion. Houston, we have a problem. Top photo: D J Shin – My Toy Museum via Wikimedia. Jan Fröjdman used real images of Mars taken by the HiRISE camera on NASA’s Mars Reconnaissance Orbiter to create this rendering of a Red Planet flyover. NASA has released a new map of the earth at night. The clickable, zoomable version is here. Water. Not Just For Earthlings Anymore. 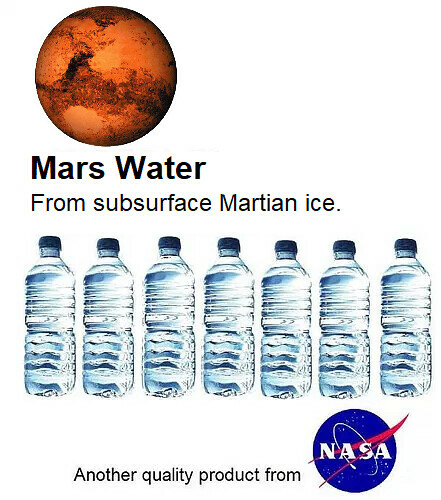 With the help of HiRISE, a powerful camera aboard NASA’s Mars Reconnaissance Orbiter, scientists have found vast quantities subsurface ice reserves that astronauts could mine for drinking, growing crops, or converting into hydrogen for fuel. 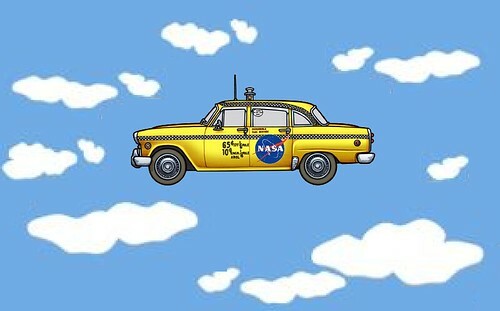 Uber is joining NASA in developing software to manage air taxi control software. The ride sharing firm is working to develop a fleet of battery-powered flying cabs and hopes to test them in several cities in the next two years, with full implementation in time for the 2028 Summer Olympics in Los Angeles. “Lunar,” A short film by Christian Stangl using archival photos and audio from NASA. Soundtrack by Wolfgang Stangl. 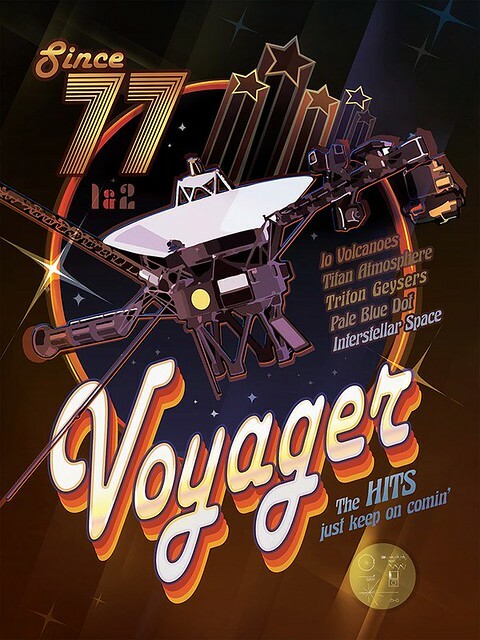 The NASA Voyager space probes were launched in 1977, the Age of Disco. They’ve been staying alive for 40 years, and are now 13 billion miles from Earth, traveling through deep interstellar space. NASA’s Jet Propulsion Laboratory is celebrating the anniversary with free commemorative posters. See the Voyager film, The Farthest, on PBS. Seven new Earth-sized planets have been discovered orbiting a (relatively) nearby star. The star, called Trappist-1, is much smaller than our sun, and is classified as an ultra-cool dwarf. To this stunning announcement we only add this observation: Ultra-Cool Dwarf would be a great name for a rock band. The newly discovered exoplanets very likely have liquid water, meaning they may host alien life forms not yet in the Trump Administration.